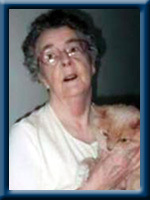 CROUSE – Marjice Rose (1937 – 2011) of Hillsview Acres, formerly of Bridgewater, passed away in Queens General Hospital, Liverpool on February 11th, 2011. Born in Italy Cross, Marjice was a daughter of the late Fred and Gertrude Crouse. Marjice had a big love for animals especially the two resident cats at her home in Hillsview Acres, Middlefield. Marjice’s life was greatly fulfilled by the staff and residents whom she accepted into her heart as family. She is survived by her sisters: Alice (Patrick) MacMillan and Velma (Sam) Simpson. Her brothers Malcolm (Marion) and Melvin (Donna). Special Stepdad Rex Legay as well as many aunts, uncles, nieces, nephews. Friends Marie, Yvonne and telephone buddy Muriel. Although Marjice had no children of her own, she loved and was loved in return by Nicholas, son of niece Donna (Lawrence), Patrick, Emma and Connor, children of niece Gena (Neil), Nolan and Carter, sons of niece Julie (Corey), Jayden, Chase and Taelor, children of nephew Phillip (Shawna). She was predeceased by her infant sister Rose and sister Doris Melanson. Brothers Eugene and Darrell. Cremation has taken place under the direction of Chandlers’ Funeral Home, Liverpool. A graveside memorial service will be held Friday, May 6th at 11:00 a.m. in Brookside Cemetery, Bridgewater. No flowers by request, donations may be made to the Hillsview Acres Auxiliary. Online condolences may be made to www.chandlersfuneral.com. We are very sorry for your loss. We know how much you treasured Marjie and the wonderful memories you have .She truly loved children and was blessed to have her great nieces and nephews in her life. May she rest in peace. A Poem I found and wanted to share with you…. Don’t lengthen it now with undo grief. Marjice,was a great lady.She had so much love to give to all the animals.The cats meant so much to her. She had a special name for me at work.The special time I had sitting with her will always be in my heart. So glad that i had the chance to be part of her life.I miss her smile.God bless you marjice,your with the angels now. You will never be forgotten. Love Dale XOXO. I just read of Marjice’s passing in this mornings paper. I know you all treasured her and will miss her. She was a sweet person that I remember as always having a bright smile.